Get lower rates on thousands of hotels. > English . AUD $ . You can only access your trip information and Expedia Rewards points from the Expedia site you booked on. Join Expedia Rewards. By joining I accept all terms and conditions. Children under 2 must either sit in laps or in seats. Please correct the errors below. Please complete the highlighted fields below. Search over 1,000,000 properties worldwide and 550 airlines worldwide. No Expedia cancellation fee to change or cancel almost any hotel reservation. Previous image, 12 total items. Next image, 12 total items. Experience Victoria’s fine wines, delicious regional produce and unique wildlife in a beautiful natural setting. 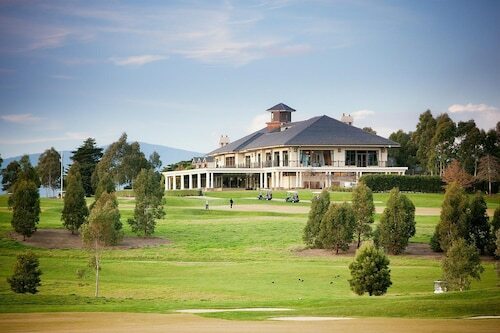 Victoria’s Yarra Valley is a magnificent natural escape within easy driving distance of Melbourne. Here, the vineyard-dotted banks of the Yarra River give way to the forested mountains of the Dandenong Ranges. This internationally acclaimed wine region offers a range of relaxing retreats, wineries and fine dining experiences set amidst scenic landscapes. The Yarra Valley’s wine-growing region is recognised as one of the world’s finest for cool climate wines. Visit more than 90 cellar doors and sample wines from famous estates and small boutique wineries. Try chardonnay and pinot noir, the region’s award-winning wine varieties or try the valley’s famous Domaine Chandon sparkling wine. The valley also has a rich history of beer and cider production. Hit the Yarra Valley Cider and Ale Trail to take a scenic journey between the breweries nestled in the hills. Indulge at one of the Yarra Valley’s highly acclaimed restaurants. Many winery restaurants feature stunning vistas of the rolling hills, lined with vineyards and framed by the green peaks of the Dandenongs. Try a long lunch made with fine regional produce and matched with local wines. Visit the Yarra Valley Chocolaterie and Ice Creamery for a delicious and family-friendly experience of some of the region’s fine produce. In the heart of the Yarra Valley is Healesville Sanctuary, an expansive bush estate where you can encounter some of Australia’s wildlife, including kangaroos and koalas. Learn about the area’s Wurrundjeri Aboriginal people at the sanctuary’s historical exhibits. Explore the untamed landscape at Marysville’s Yarra Ranges National Park. Don’t miss the TarraWarra Museum of Art, a public visual arts museum with a focus on Australian art from the mid-20th century to today. 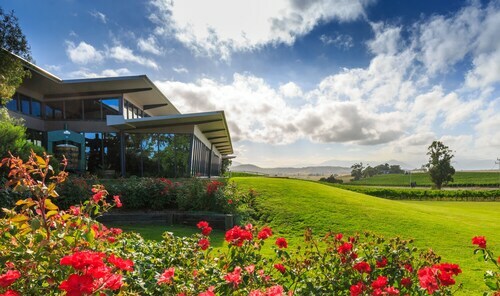 The Yarra Valley is just 50 kilometres (31 miles) from Melbourne, Victoria’s capital city. Explore the region’s towns and wineries by car, charter tour or by bicycling along the network of cycling trails that traverse the picturesque valley landscape. Get up close and personal with Australia’s iconic wildlife and learn how rare native species are protected in of one of the country’s most famous wildlife parks. Located in a rural location, this family-friendly hotel is within 9 mi (15 km) of Lillydale Lake, 100 Acres Reserve, and Yering Meadows Golf Club. Croydon Golf Club at Yering Meadows and The Eastern Golf Club are also within 9 mi (15 km). 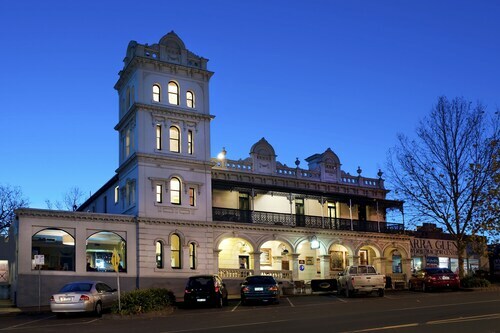 This family-friendly Yarra Glen hotel is located in a rural location, within 1 mi (2 km) of Alowyn Gardens and Yarra Valley Chocolaterie. Yileena Park and De Bortoli - Yarra Valley are also within 3 mi (5 km). Situated in Badger Creek, this campground is within 3 mi (5 km) of Healesville Wildlife Sanctuary, Healesville Glassblowing Studio, and Four Pillars Gin. Rochford Wines Yarra Valley and Maroondah Reservoir Park are also within 6 mi (10 km). 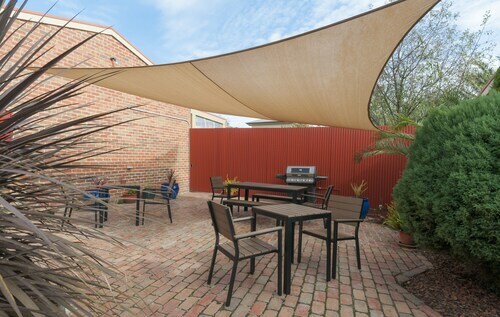 Situated on the riverwalk, this motel is 0.8 mi (1.3 km) from Yarra River Walk and within 6 mi (10 km) of Blue Lotus Water Garden and Bulong Estate. Redwood Forest and Rayners Stone Fruit Orchard are also within 12 mi (20 km). 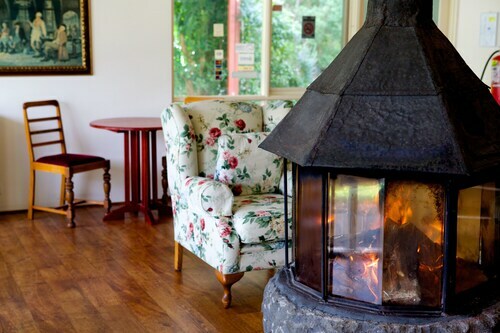 Situated in Badger Creek, this motel is within 3 mi (5 km) of Healesville Wildlife Sanctuary, Four Pillars Gin, and Healesville Glassblowing Studio. Rochford Wines Yarra Valley and Maroondah Reservoir Park are also within 6 mi (10 km). Situated on a lake, this campground is 1.1 mi (1.8 km) from Healesville Wildlife Sanctuary and 3 mi (4.8 km) from Healesville Glassblowing Studio. Rochford Wines Yarra Valley and Four Pillars Gin are also within 6 mi (10 km). 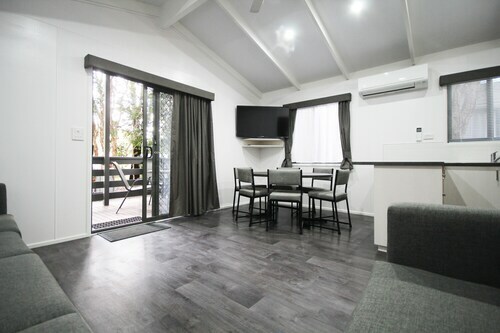 Situated in the suburbs, this motel is 0.6 mi (0.9 km) from Lillydale Lake and within 12 mi (20 km) of The Eastern Golf Club and Rochford Wines Yarra Valley. Yarra Valley Chocolaterie and Puffing Billy Steam Train are also within 20 mi (32 km). Lilydale Station is 13 minutes by foot. 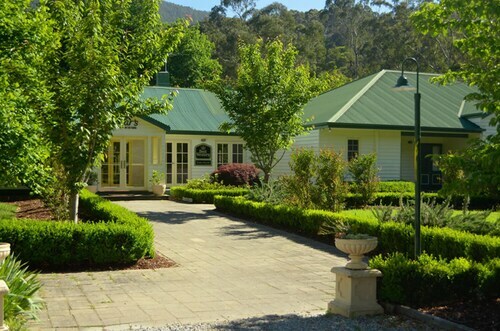 Situated in Yarra Glen, this hotel is 1.3 mi (2.1 km) from Yering Station Winery and 1.9 mi (3.1 km) from Yarra Valley Chocolaterie. Croydon Golf Club at Yering Meadows and Healesville Wildlife Sanctuary are also within 12 mi (20 km). These prices were available within the past 7 days. Prices quoted are per person, return, for the period specified. Prices and availability are subject to change. Additional terms apply. Wed., 29 May - Sun., 2 Jun. Thu., 30 May - Thu., 6 Jun. Fri., 31 May - Sun., 2 Jun. Sun., 18 Aug. - Fri., 13 Sep.
Wed., 29 May - Tue., 4 Jun. Wed., 4 Sep. - Wed., 11 Sep. Looking for Flights, Hotels, Car Hire and Holiday Rentals in Yarra Valley? Expedia, Inc. is not responsible for content on external Web sites. © 2019 Expedia, Inc. All rights reserved.